Is the Recent Stability Stable? 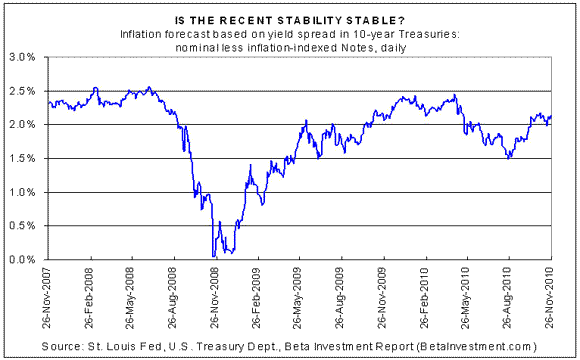 HomeBusinessIs the Recent Stability Stable? The Fed’s latest round of monetary easing—QE2—has stabilized inflation expectations at a modestly higher level of late. Since mid-October, the inflation forecast based on the yield spread between the nominal and inflation-indexed 10-year Treasuries has bounced around in the low-2% range. That represents a victory of sorts from the summer plunge in the market’s inflation outlook, when fears of a new recession were on the rise. It’s tempting to declare that QE2 has been a success and that all’s well. But that’s premature. It will take many more months to assess the impact on the economy. Meantime, we’re in a precarious state of stability. It is clear to those working in the bond markets that the debt crisis in the EMU periphery is nearing danger point, and risks spiralling out of control as quickly as the Lehman-AIG-Fannie-Freddie crisis in 2008. Prof Willem Buiter, chief economist at Citigroup, said last week that Portugal is likely to need a rescue before the end of the year and that Spain will follow “soon after”. Back in the U.S., the stock seems to be waiting to see what happens next. The S&P 500 continues to move sideways after consolidating its autumn rally. Meantime, the U.S. Dollar continues to rally, despite the formal announcement of QE2’s monetary stimulus earlier this month. 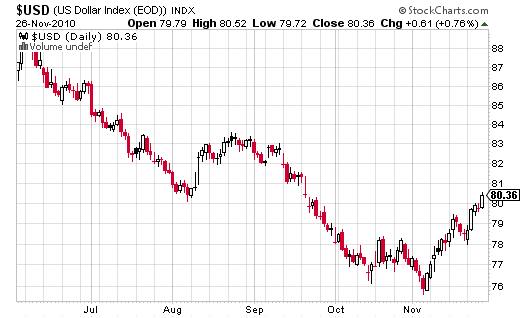 The greenback’s November rise is a sign that the global appetite for risk is waning…again. European governments yesterday handed debt-strapped Ireland an 85 billion-euro ($113 billion) aid package. Finance chiefs ended crisis talks in Brussels by endorsing a Franco-German compromise on post-2013 rescues that means investors won’t automatically take losses to share the cost with taxpayers, a plan proposed by German Chancellor Angela Merkel. Debt, in other words, remains front and center as the key risk for the global economy, particularly in the developed world. The Federal Reserve has been fighting the blowback with monetary policy, and upping the ante recently with QE2. There’s been some traction with this policy, but its effects are now waning, in part because the debt crisis in Europe is reviving as a clear and present danger, as it did in the spring. Indeed, it was fears of a deeper European debt crisis earlier this year that triggered the summer selloff. Is a repeat performance brewing? The risks are still low, but those risks are rising. That raises the pressure for good news with this week’s economic reports. The big number arrives Friday, with the November employment update. The consensus forecast calls for a net rise in nonfarm payrolls of 130,000, according to Briefing.com. Not great, but enough to keep the demons at debt at bay, at least for a time—assuming, of course, the forecast is accurate.